factory_authorized_outlet has no other items for sale. 1-Year Factory Warranty - Free Shipping!!! PayPal is the only payment method we accept. All Electrial Items are for 120V / 60Hz power unless otherwise noted. Your order will usually ship within 24 hours after payment. 30 Day Satisfaction Guarantee. See store policies for more details. Please call 800-629-3325 for any questions. All ok excellent seller , excellent package, shipping very fast.thanks for all. Fast shipping! Great seller! Seems to be a good product. EXCELLENT PRODUCT AT AN EXCELLENT PRICE! SUPER FAST SHIPPING! Gracias por sus servicios y rapidez. Generator ran 1HR and seized .. no response from seller ,stay away !!!!!!!!!!!!! Started out of the box, but no amperage. Need to order parts? Not great. GREAT PRICE GREAT Quality!!! Just Do IT!!!! This is my second Duromax. I gave my 5 year old Duromax to my sister to power her home during outages. This Generator has NEVER let me down. We start it every month on the 1st, to run. Put Sta-bil in it in the winter and still starts up every time. We ran it once five days non stop and not a problem. Last month we had a 24 hour power outage and no issue. Change the oil once a year. Start it every month and will last for years. Yes I have Had Honda and quieter, but for the MONEY just cannott beat Duromax. 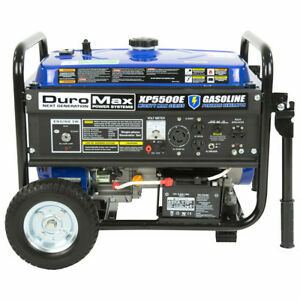 Great generator for home at a super price. This generator is of good quality very reasonable in price and is ideal for working around were you don't have access to power it has started easy ran smooth and is easy to transport I highly recommend it for those that are looking for a worksite generator around the house fuel consumption depends on how many devises are hooked up to it all in all it's a great little machine ! Thank you Barry Marshall. I never heard of this brand but after internet homework I made the purchase. Surprised by the small size and very happy with the low noise level. Only thing I would do different is I should have purchased the dual fuel. Smart size for many uses ! Very fine medium size Generator. Runs multiple heavier grade household machines and electric tools with a line to a 2HP WELL pump, fill and empty your inground pool with little cost. Run lines and lines of Christmas decorations and keep a normal power bill from electric company. Smart alternative !!!!. A smaller home can depend on this with an electrical box connection and be OK. The motor and electric start run fine The weight is fine for one strong man to raise. the 10,000 are heavier and definetly double the noise, so this is a focal point- NOISE. A larger home and greater demands really need that larger 10,-15,000 size. I need to be noise conscious near the house so the big one lives in the garage for emergencies. This machine and size is not a problem and easily used for many purposes. Powerful generator at a fraction of the cost of other brands. We take this generator to our acreage to power our well and it has sufficient power plus can run other tools. We are very pleased with the quality and much lower cost than comparably sized generators. Thank you.